So You THINK You are Going to Heaven? Posted byDavid Ward	 April 5, 2011 June 25, 2011 2 Comments on So You THINK You are Going to Heaven? This is for those who think they are “Christian” and think they are going to heaven. It is not for the unbeliever, the lost, the one’s in this world who have no understanding or interest in who G-d is. Do you really know you are going to heaven? Do you really think you are a Christian? Do you REALLY believe that there is a Hell? 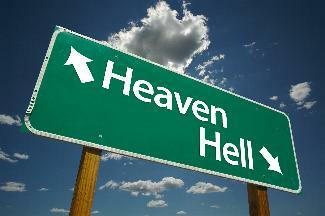 Do you REALLY think that if you live in habitual sin, that you have any place in heaven? Do you REALLY think that a simple prayer can get you saved from your sins? Do you not know that there can be no salvation without repentance? Is THIS what you call Christianity? God did this not to punish Saul for his evil deeds, but rather chose to reveal how great a God He is to the unbeliever. It is when we fail to hear and to heed the voice of God that we put ourselves in jeopardy of an eternity without God. It’s people like you that make religion such a big deal that you forget the real world. We are all going to heaven if there is one. God does not send anyone to hell.